Typically, we don’t make soups for Thanksgiving and Christmas, but why not break this little festive rule? 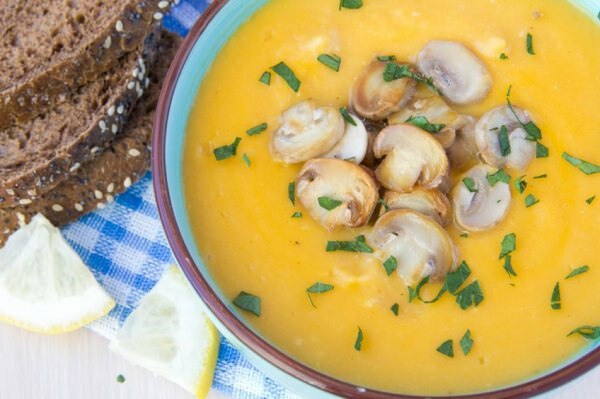 Pumpkin mushroom soup will be a sophisticated addition to your Thanksgiving dinner. This thick and savory soup is so good and comforting that your guests won’t leave a spoonful by the end of the dinner. Place onions and mushrooms in a saucepan and saute in butter. Add curry powder and flour and continue cooking and stirring until bubbly. Add your chicken or vegetable stock to it. Do it gradually, cup by cup. Bring to a simmer. Lower the heat and add pumpkin puree and the other ingredients from the list, except the cream. Cook, stirring, for 15-18 minutes. Add cream and cook on very low heat without boiling.